a rigid material fashioned so as to project outward from around the neck of a dog or cat and prevent the mouth or teeth from damaging skin, casts or dressings on the legs or body. X-ray film or heavy plastic sheeting are usually used for this purpose. Also used in birds. in birds, reversing the collar permits better movement and is better tolerated. improvement of alopecia or traumatic skin lesions after placement of an Elizabethan collar for a short period of time will identify the cause as self trauma or excessive grooming. An e-collar, or Elizabethan collar, is a cone-shaped collar that stops the dog from irritating his eyes. Care usually involves pain medication and cleaning and dressing wounds, plus an Elizabethan collar to suppress any licking. The term Elizabethan collar is still heard frequently, but because it tends to be shortened to e-collar and because that's also a shortened version of electronic collar, the phrase is falling out of use for this application. Treat your pet's skin immediately and make efforts to deter their access to the wound site by using an Elizabethan Collar. In contrast to Flash Gordon with the tight outfits, his rival, Ming the Merciless, wore too much make-up and a flowing gown topped by an Elizabethan collar. After the pit strike in 1984-5 she took to wearing what I can only describe as an Elizabethan collar. Millie can be stopped from licking the area with an Elizabethan collar, or a sock or bandage to try and break the itch-lick cycle. 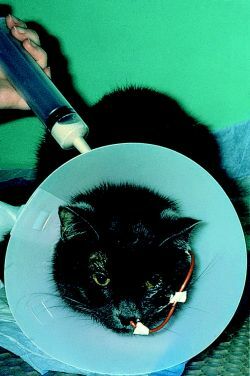 An Elizabethan collar was used after the surgery for 7 days to prevent self trauma. While you are there, see if you can get a small Elizabethan collar, which may help to break his peckish habit. was promoting licensed characters from Hackman, The Dog in a Bucket, based on the comic book adventures of Hackman, a dog that wears an Elizabethan collar and uses a time machine. One owner followed our instruction to cage the dog for a week and use the Elizabethan collar to prevent it from licking its wound. Treatment can include antibiotics and other medicines, and the dog may need to wear a protective Elizabethan collar to stop it scratching. Elizabeth Wende Breast Clinic, Inc.